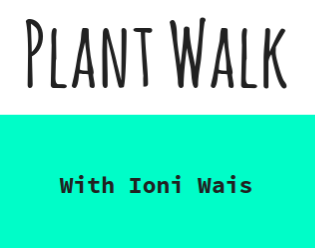 On Sunday May 15th, botanist/educator Ioni Wais gave a plant walk at the Powell River Farmers' Market. Plant walks are an opportunity to engage the public in studying and appreciating the wonderful world of plants and fungi. Every month, Ioni will be giving one of these walks at the market, starting at 2 pm and running for 30 to 45 minutes. Walks are by donation. The next walk will be taking place on Sunday June 19th at 2pm. On this first walk, Ioni focused on some very introductory topics related to plants and fungi, and shared some edible & medicinal uses of common plants. One of the first plants that was encountered on this walk was the Horsetail plant (Equisetum sp.) This is not a seed-bearing plant, but rather a spore-bearing plant, being closely related to the ferns. Certain species of horsetail are edible in the spring, and can be used to make a blood-cleansing tea which is high in silica. Ioni also talked about Western Swordfern (Polystichum munitum), one of the most common ferns in coastal BC, used by the Coast Salish as a food in the spring. There were many coniferous trees to be seen on the walk as well, including Cedar (Thuja plicata), Douglas Fir (Pseudotsuga menziesii) and Western Hemlock (Tsuga heterophylla), all with different edible/medicinal uses, and other ethnobotanical properties. Coniferous trees are seed-bearing plants that do not bear fruit. Instead, they bear their pollen, ovules and seeds in specialized cones. Ioni talked about how to tell these trees apart, and what sorts of things they can be used for. In addition to the conifers the group encountered, the group also saw many flowering plants. Flowering plants bear their ovules inside an ovary, which becomes a fruit after fertilization. The Alder tree (Alnus rubra) is a great example. Alders are common nitrogen-fixing trees that grow quickly and are among the first to colonize open areas. "Witch's broom" is common on this tree, and result from disease and stress. Another tree that was encountered was the Mountain Ash (Sorbus sp. ), also known as Rowan; one of the participants told the group about the way she used its berries for jams... but they are best harvested after the first frost, or they will be far too sour. Another participant, a young boy, was very surprised to hear there were 3 types of blackberries growing on the market grounds; he asked if you could eat the different types, and was happy to hear that all Rubus fruits are edible. Lastly, Ioni talked about the importance of fungi in breaking down woody material and sustaining the soil systems of the forests around the market. Fungi are the teeth of the forest, though you can't hear them chewing! All in all, the walk was a fun introduction to the wonderful world of plants! Thanks, Ioni!